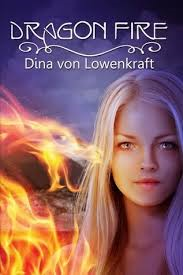 Dragon Fire by Dina Von Lowenkraft is a 2013 Twilight Times Books publication. I was provided a copy of this book in exchange for an honest review. "Some choices are hard to live with. But some choices will kill you." Anna is attracted to Rakan unaware that he is a shapeshifting dragon. She doesn't know that Rakan and is clan are out to kill her best friend, June. Rakan isn't supposed to be involved with Anna and of course he is conflicted about his duty to restore his family's honor, which would mean killing June. So, why is June the target of Rakan and his clan? It appears they believe she is the ancient dragon that killed Rakan's half sister's father. This YA fantasy is not your usual dragonshifter novel. In my humble opinion this book would fall more into the high fantasy or even the epic fantasy category. Don't be fooled by the YA label either. This book would appeal to anyone that enjoys fantasy novels. This author is very talented and knows how to weave a complex tale. I foresee more in this series and predict that it will be very successful if this first book is any indication. My only issue was that I did have a hard time keeping some of the words straight. By that I mean that perhaps a glossary would have helped me out with the meaning of the words that were made up for use in this story. Other than that this is a wonderful start for this author. Overall I give this one an A.